Playtime is a top priority at Madera County’s 2,000-acre Riverstone master-planned community. 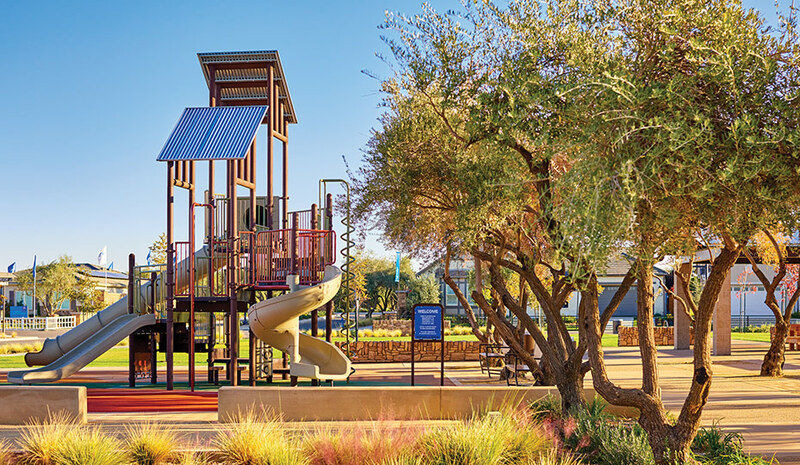 Within Riverstone’s inaugural residential neighborhood, the Lodge District, families are already enjoying two parks—and three more family parks are on the way. All five parks are located conveniently close to Riverstone’s first collections of stylish, innovative new homes that are now selling. Riverstone’s Garden Park features barbecue areas, a kids’ play structure and a large communal table for outdoor dining. It’s one of five parks in the community’s Lodge District residential neighborhood. Just a short walk or bike ride away from Riverstone’s homes, Adventure Park offers play structures, climbing boulders, three different slides and grassy areas for all kinds of kid-sized fun. 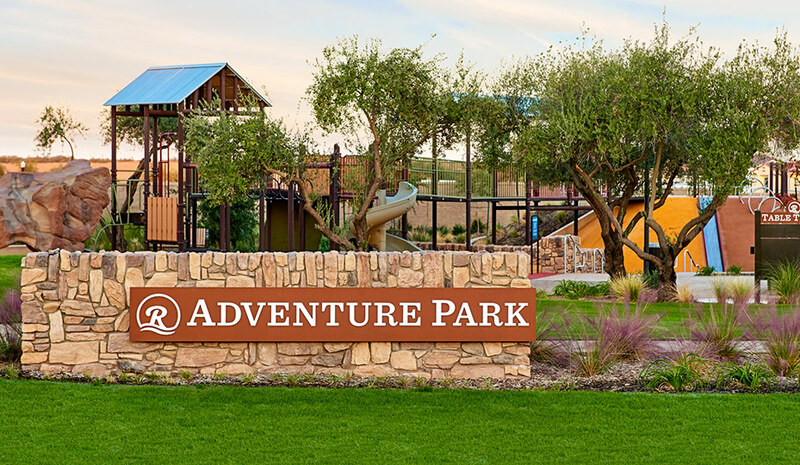 Adventure Park, now open at Riverstone, is an active play area with spaces designed for children from ages two and up. The park features play structures, table tennis, climbing boulders and the fun of three different slides—all with a soft, spongy ground to safely cushion youngsters’ falls. Designed for more relaxing, adult-sized fun is Riverstone’s Garden Park, with barbecue areas, bocce ball, shade structures and a large communal table ideal for outdoor dining. The three planned additional parks coming to Riverstone’s Lodge District residential neighborhood include Pavilion Park, which will open soon and feature play equipment, tire swings and an enclosed mini field for soccer and field hockey. Construction will be starting soon for Expedition Park, which is planned to offer a play structure, ping pong, community tables and barbecue areas; and Tournament Park, which is expected to include an outdoor shade structure, two pickle ball courts and a creative, street-like play area where kids can safely ride bikes. Just a short ways away from the parks, and anchored right in the heart of the Lodge District, is “The Lodge” itself, a creatively envisioned, resort-style community clubhouse that’s in a class all by itself. Exuding a contemporary-agrarian architectural style, The Lodge offers an array of exceptional amenities. Within its expansive interior spaces, residents are free to enjoy a Great Room and flexible gathering places with WiFi, a demonstration kitchen, and a state-of-the-art Fitness Center with advanced exercise equipment. Just outside, The Lodge features a resort-style pool and spa with poolside cabanas, a children’s pool, an outdoor bar with firepit conversation areas, a community garden and a Gear Barn outfitter’s cabin featuring a variety of gear available for homeowners’ on- and off-site adventures. In addition, a Concierge is stationed in The Lodge to plan community-wide events and smaller gatherings.